A well-crafted text is a wonderful thing. Why? Well, because these days, so many emotions are taken away by emojis. And while emojis are great, Mother’s Day is a sentimental holiday that should require more substance. 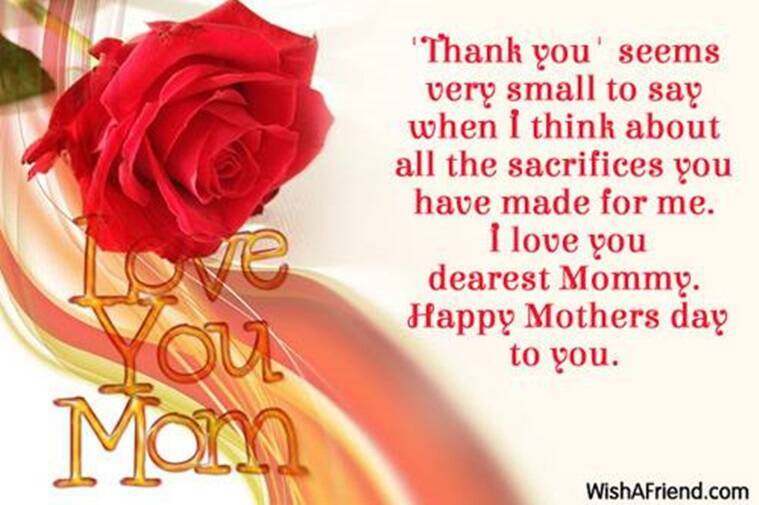 At the very least, you’ll want to convey to your mom that you’re so glad she’s such a cool and inspirational lady. Even if you and your mom aren’t, say, Gilmore Girls-level close, it’s still a good thing to acknowledge the holiday. In fact, a text might be perfect in a situation like this. It shows that you’re thinking about her, and hope she’s doing well. Of course, even if you two are close, it’s possible that texting is just your prime way of communicating. So amidst the 900 texts you normally send, you’ll want to make sure your Mother’s Day text is top notch. If you’re suffering from a bit of writer’s block, here are a few good suggestions on what to send. Mother’s Day is great, but it’s kind of important to acknowledge that your mom really made a lot of sacrifices in life so that you’d grow up as well-adjusted as you did. You should make sure to tell her that her wise words and emotional support mean something to you every day, not just today. It might sound cliche that there’s “nothing greater than a mother’s love,” but it’s true. When a child is born, the attachment a mother feels is pretty much immediate. It’s weird, but it’s one of the reasons as to why we often form such strong relationships with our moms. The bond is tight. There’s a good chance she’ll respond to this one with “likewise.” Children really mix things up, but your mom has been there for you since the beginning. Your schedule is so jam-packed, and your mom is fully aware of it. In fact, you usually vent to her about having no free time on a weekly basis. A text like this shows that you want to make more of an effort for a little more one-on-one time, and it’s such a sweet gesture. 5 ” I see so much of myself in you. I’m going to get personal here — my own mom passed away around 13 years ago. Even so, I’ve noticed so many little things I do now, as an adult, that are so like my mom. I think she would have appreciated the fact that a lot of her traits have continued on — even the quirky ones. I can imagine that something like this would be the ultimate compliment if it came from the right place. Moms often don’t get a lot of compliments. In fact, some people assume that mothers do what they do simply because they have to. Sure, they’re expected to fill a certain amount of requirements, but you turned out so well because your mother went above and beyond. Make sure you recognize that. RELATED: TEXTING MANUAL 4 EVERY1 – THE #1 TEXTING MANUAL 4 PPL OF ALL AGES, CLICK HERE NOW. 7“Plan for a bunch of hugs when I see you next. “Hugs are great. They make you feel good, and you don’t have to carry them around with you if you live a distance away. From here, you can plan a specific day and time for a lengthy and worthwhile visit. 8. Send over some throwback photos. 9. Text over a poem. If you’re not a writer, you can probably find something that definitely relates. This is a nice text to get, since it’s totally different than your standard text, and is the closest thing you can get to a “texted gift.” If your mom is an avid reader, she’ll love it even more. 10“You’ll always be an important part of my life. Sometimes, as you grow older, your mom kind of feels like she might be “intruding” into your new life. It’s important for her to know that no matter what, she’ll always have a place. This entry was posted in Uncategorized and tagged #Text2Sex, #TextingManual, #TextingTips, sext, text on May 13, 2018 by yfi9sy. I read this article and found it very interesting, thought it might be something for you. The article is called 10 Things To Text Your Mom On Mother’s Day, If You’re Not Spending The Day Together and is located at http://www.fiftyshadesofsexting.com/blog/10-things-to-text-your-mom-on-mothers-day-if-youre-not-spending-the-day-together/.